Blaring train horns are making life a misery for a group of residents living near tracks in Brighton. Householders in Highdown Road in Hove say horns on the new trains are louder than before and wake them up in the early hours of the morning. Overall about 60 residents have complained about the noise and want something done to make the horns quieter. Ivor Caplin, MP for Hove, said: "You get used to the train noise itself but if horns are going off at 0515 BST or 0530 BST in the morning that can be very disturbing particularly if you have a young family. "There are a lot of parents with youngsters in the constituency. That is why we have to get it right." Officers from Brighton and Hove City Council have been to the area to measure the levels of noise produced by the horns. 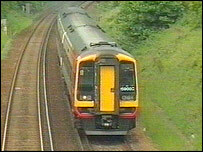 The Rail Safety and Standards Board said it was aware of the problem and was working with operators. South Central Trains said the noise levels were set to comply with current standards and the horns have to be sounded as a warning to people that may be on the track. An industry review of noise levels is due to be completed within a month.